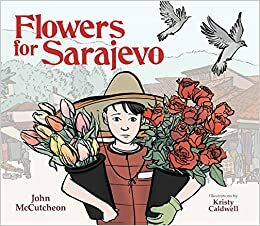 Summary: Drasko helps his father sell flowers on the streets of Sarajevo. But when war comes to their city, his father has to go away to fight. Drasko is left on his own, and the older merchants push him away from the prime selling locations to a corner of the square. The only good thing about his location is that he backs up to a concert hall and gets to hear the orchestra play. One terrible day, at ten o’clock in the morning, a bomb falls on a nearby bakery, killing 22 people who were waiting to buy bread. The next morning, when the clock strikes ten, a cellist from the orchestra comes out to the street and plays a sad and beautiful melody. He continues to play every day at ten o’clock for 22 days, one day for each person killed by the bomb. Slowly, life begins to return to normal in the square again, and Drasko works hard to do his part to make it beautiful once more. Includes information about the Balkan region and Sarajevo, an author’s note about the events that inspired this story, additional resources, and the words and music to the author’s song, “Streets of Sarajevo”. The book comes with a CD that includes this song and Albinoni’s Adagio in G Minor, the song played by Vedron Smailovic, the cellist in the story. 32 pages; grades 3-7. Pros: A sad, moving, and ultimately hopeful story about a part of history kids may not know much about. The muted illustrations complement the story. The musical tie-in adds another interesting element to the book. Cons: Definitely a picture book for older elementary and middle school students, needing adult support to fully understand the story. I remember this event, and it’s nice to see the story shared in a picture book format.